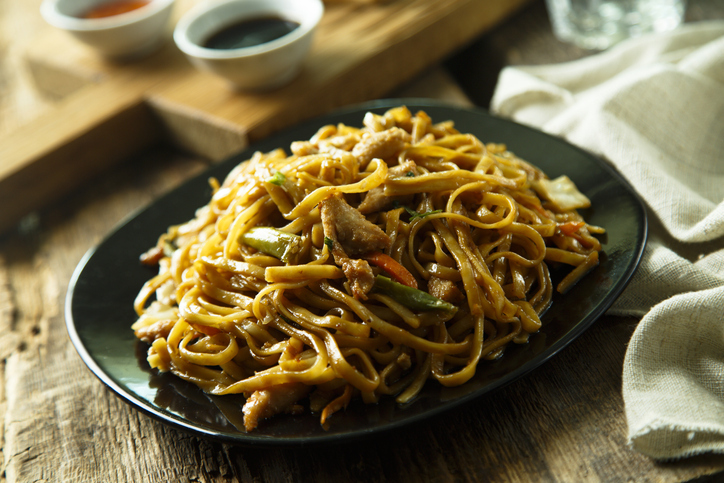 Longevity Noodles, or yi mien, is a popular dish served on birthdays and other celebratory occasions to symbolize long life, prosperity, and good luck. This simple version is an egg drop soup served over noodles. It is also a great way to get your international student in the kitchen and use up that leftover holiday ham. For added contrast in texture and color, add a green vegetable. Pour the hot broth over the noodles. Garnish with the chopped ham and green onion. Use the wok to poach the eggs. The poached eggs are placed on the noodles, and the sauce is poured over. Garnish with the green onion and the sliced ham as in the recipe above.